Douglas received his BA from the University of Nebraska – Lincoln in 1922. He later studied at the Winold Reiss art School in New York and In Paris before obtaining his MA from Columbia university in 1942. He is acknowledged as one of the important figures in the Black Renaissance of the 1920’s and his book illustrations and mural decorations have become landmark achievements in the art of that period. 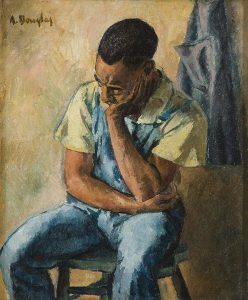 Douglas was invited to establish an art department at Fisk University, Nashville, Tennessee in 1937. He retired from that position as Professor Emeritus in 1966.